Inventory We are a resale marketplace, not a box office or venue. Ticket prices may exceed face value. This site is not owned by Santander Arena . The Santander Arena is the premier venue in Reading, Pennsylvania to see the hottest traveling performers and shows. The Santander Arena is a multi-purpose arena that has a seating capacity of 7,083.The arena is highly functional as a banquet hall, business or social gathering place, sporting arena, concert hall, and ice rink. The facility features numerous rooms for hosting parties or meetings with anywhere from 10-200 guests. The venue hosted the Jehovah’s Witness Convention from 2005-2013 and now continues to host it after taking a break in 2014. 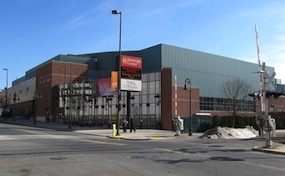 The Santander Arena box office is located at 700 Penn Street in downtown Reading. Santander Arena tickets have included a 4-show stay by Pearl Jam for the 2004 vote for change tour, WWE events, and the traveling Professional Bull Riders series. The arena is home to the Reading Royals of the ECHL and the Reading Express of the IFL. Santander.ArenaReading.com is an independently owned and operated company that concentrates in online sales in the secondary market. We are not affiliated with any primary supplier, box office, or official site. Ticket prices may be below or above face value and can change rapidly with market conditions. To order tickets to any Sovereign Center events please follow the steps online through checkout or call our operators at anytime.